Simple, healthy and delicious, this Sri Lankan Beetroot Curry is gluten free and of course vegan too. 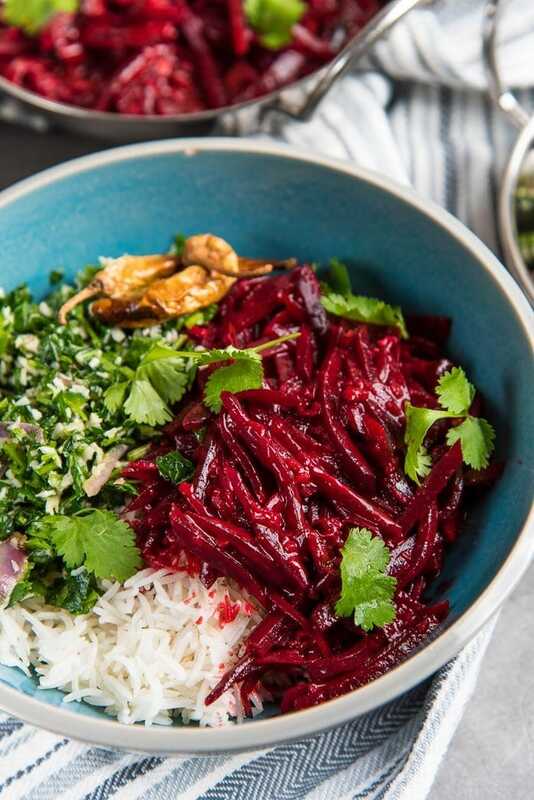 This Beetroot Curry is a comforting dish that pairs well with steamed rice and other side dishes. 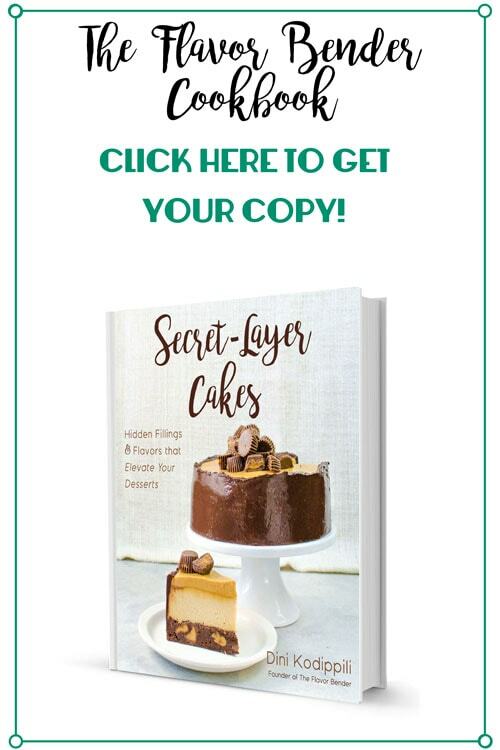 It’s been a while since I shared a recipe with you guys on the blog, and there’s a very good reason for that, but more details on that later! 🙂 For now, I’ve got this simple, flavorful, comforting Sri Lankan Beetroot Curry recipe to share! 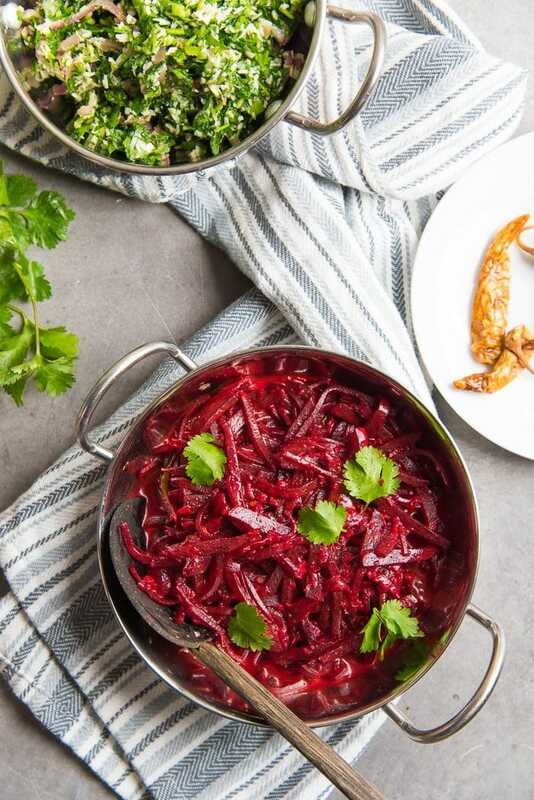 If you thought beetroot was one of those bland vegetables that was difficult to coax flavor out of, this beetroot curry is the perfect answer! This dish is a childhood favorite of mine. Chicken curry and beetroot curry along with some steamed rice was one of my favorite combos as a kid, and still is! This beetroot curry is gluten free, and of course vegan too. Beetroots are commonly grown in the hill country in the central part of Sri Lanka. They are a popular “super-food” with plenty of nutritional value. Beetroot is mainly eaten as a curry in Sri Lanka (no surprises there), but it’s also commonly used as the main ingredient to make beet salad, and to make “ribbon sandwiches” – another childhood favorite of mine that I’ll be sharing with you guys in the near future! As kids though, we didn’t care much about nutritional value, nor how popular beetroot was elsewhere. It was a little sweet, and plenty delicious, and we loved that beet red color! Even the pickiest eaters would devour the rice if beetroot curry was served with it. 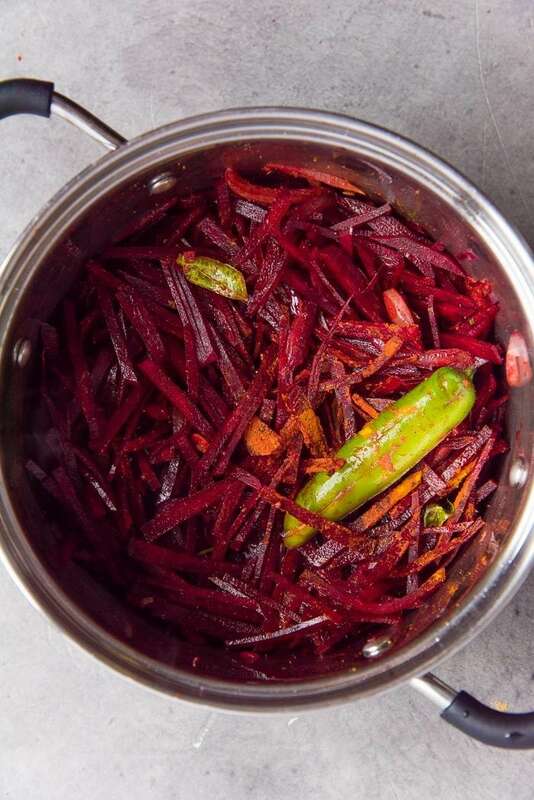 The key to perfect beetroot curry is simple. Don’t overcook the beetroot. If it gets soggy, it’ll lose quite a bit of it’s delicious potential. 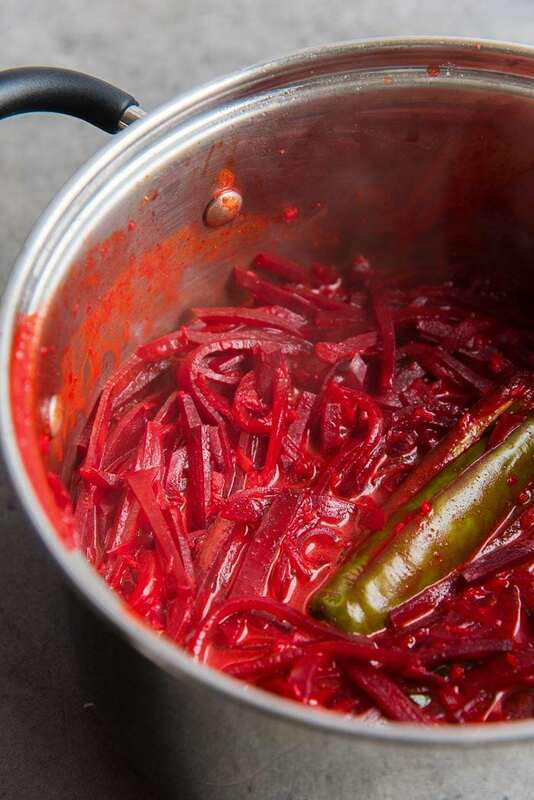 The traditional way to cook this beetroot curry is to julienne the beetroot, which is also what I prefer. Some like to simply slice the beetroot and then cut the slices in half. I have tried prepping the beetroot with a mandolin before, but the mandolin doesn’t cut it to the thickness that I like. If the beetroot is sliced too thin, then it gets soggy in the curry. 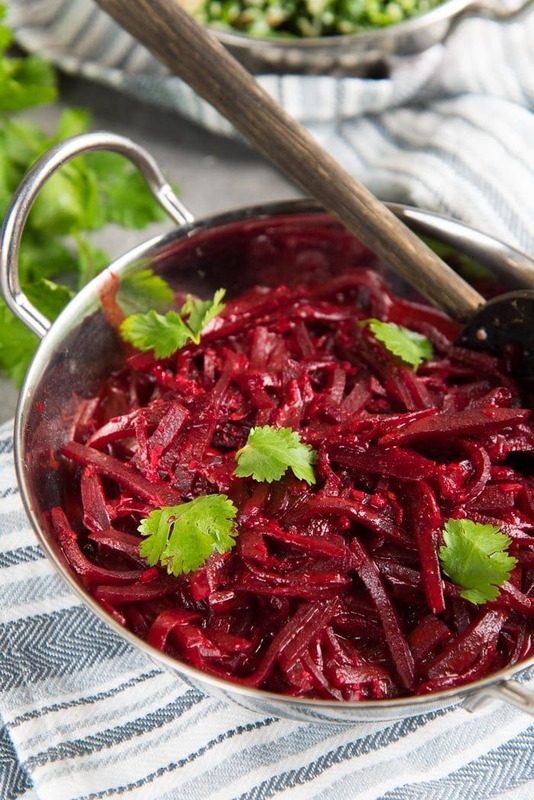 The beetroot is meant to have an “al dente” texture in this Sri Lankan beetroot curry. I’d rather have it cut too thick, than it become a soggy mess. So this is how I prepare the beetroot for this curry. First, wash the beetroot. Then slice the tops. If you buy beetroot with the leaves on top, don’t discard the leaves. You can make a different side dish with the leaves, OR slice the leaves and add to the curry. Once peeled, you can cut the beetroot into slices that are about 3 mm (roughly; no need to pull out your ruler) in thickness. My food processor has the capacity to slice beets to the right thickness, so I use that. However, I’ve often used a sharp knife to slice the beetroot as well. Once sliced, then you can julienne it. I always use a knife for this, as it gives me better control to cut batons. If you feel like that’s too much work, you can just cut the slices into thicker sections (or just cut in half, if the beets are small in size). The main thing to make sure is that the beetroot pieces that you cut are all similar in size/thickness, so that they cook evenly. Prepping and cutting the beetroot is the hardest part. Making the beetroot curry is the easiest. I like to add just the smallest amount of spice to flavor this curry. 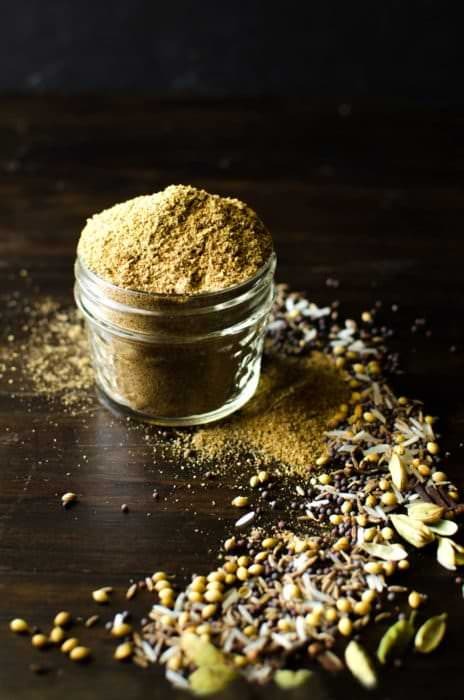 I use my own curry powder to add flavor. If you can’t make it however, I recommend using ground coriander and cumin (and maybe a pod of cardamom). Since the beetroot is cooked in coconut milk, the resulting curry gravy is creamy, sweet, with a touch of spice (you can adjust the heat to your liking), and it’s also got that gorgeous deep pink/red color! The cook time will vary depending on how you cut the beetroot. The way I cut it, it only takes about 10-15 minutes for the beetroot to be cooked to perfection. Larger pieces will take a bit longer. I also like to cook this Sri Lankan beetroot curry with the lid off (to allow excess liquid to evaporate). I prefer to add water towards the end if needed, rather than having too much liquid at the beginning, which would dilute the flavors in the curry. 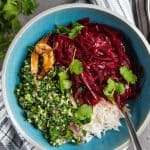 What can I pair with beetroot curry? If you’re looking for more vegan curries to pair up with this Sri Lankan beetroot curry, then I HIGHLY recommend this tart, sweet, spicy Green Apple Curry, or this sweet, spicy, sour Mango Curry. Or for a creamier curry pairing, you can try this Creamy Cashew Curry. OR just opt for a simple side salad, or a shredded leaf fry (mallung). If you liked this Sri Lankan Beetroot Curry recipe, don’t forget to subscribe for new (and free) recipes by entering your email address in the subscription box below the recipe card (and get all these recipes delivered straight to your inbox), so you don’t miss out on a thing. 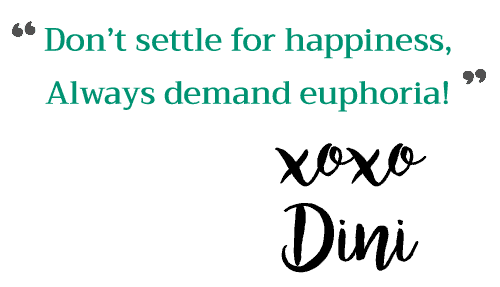 You can find me on FACEBOOK, TWITTER, INSTAGRAM, PINTEREST, and YOUTUBE too. Sri Lankan Beetroot Curry - A delicious, gluten free and vegan curry that even the pickiest eaters will love! Perfect accompaniment for rice and curry. Easy to make and flavorful. Slice the beetroot into slices that are about 3 mm in thickness. You can do this with a knife, or using a food processor with a slicing disc. 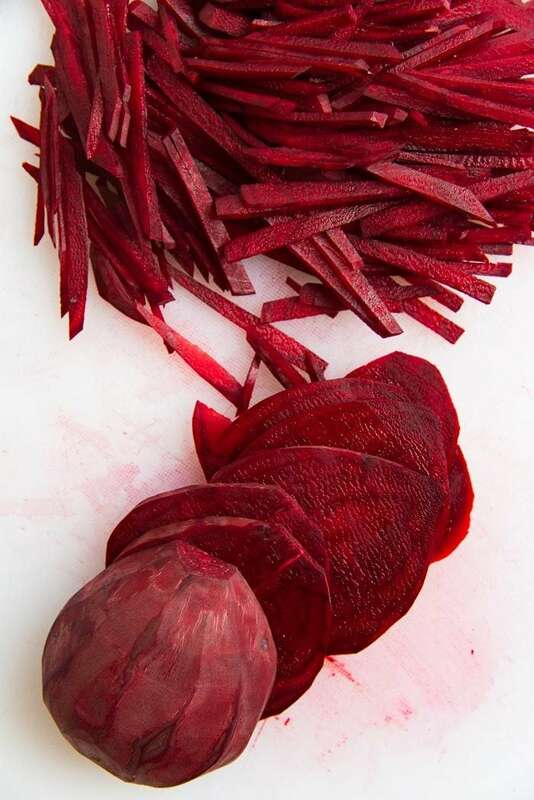 Once sliced, julienne the beetroot slices into batons. 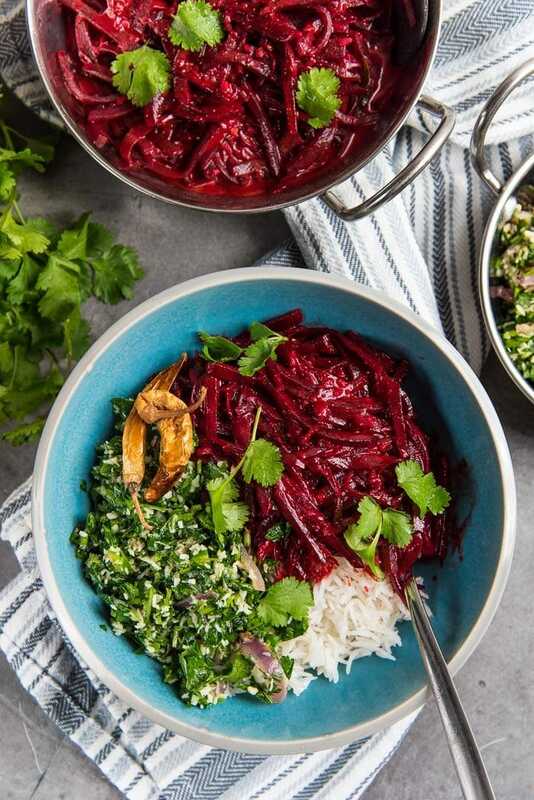 Place the julienned beetroot in a saucepan, along with the onions, sliced green chili, garlic, curry leaves, ½ tsp curry powder, ¼ tsp turmeric powder, ½ tsp cayenne pepper, and ¼ tsp salt. Mix well to combine. Stir in the coconut milk and water. Heat the saucepan over medium high heat, while stirring occasionally, until the coconut milk/water comes to a boil. Reduce the heat to a simmer, and let it cook covered, for about 5 minutes. Uncover and cook for a further 5 - 10 minutes while stirring frequently, until the beetroot is cooked to al dente (i.e. cooked through but not soggy). The cook time will vary depending on the thickness and sizes of the beetroot. If the liquid is evaporating too quickly, you can add more water or coconut milk.